I’m not certain Eric Red has ever done anything underwhelming in his life. The man long ago established an extremely solid career in Hollywood, and he’s now branched off into the realm of full-fledged horror novels. And his novels, for the record, are every bit as enthralling as his screenplays. Red just wrangles killer concepts and molds them to his own personal style. He doesn’t seem to need to force atypical premises or outrageous inventions, he understands that a good story is just that, a good story, regardless of the scope or the fine details. It’s all in how you tell the tale, and Red tells the tale like a seasoned skipper surrounding a bonfire and his mates on a rarely visited island off the coast of No Man’s Land. It Waits Below is a great example of a very basic idea exercised to extreme effectiveness. It’s an aquatic terror piece that juxtaposes dual threats over the beautiful Indian Ocean. Well, technically one threat can be found over the Indian Ocean, the other beneath the surface. 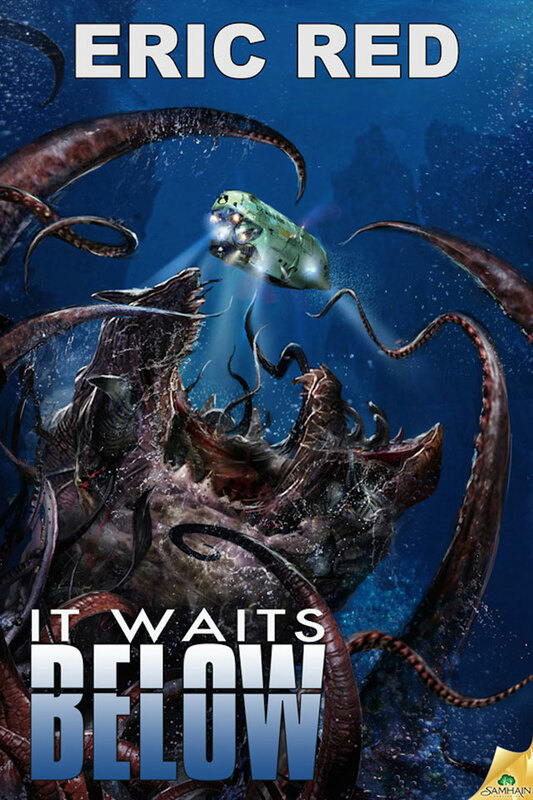 A small group of salvage experts are on a mission to get their hands on gold long thought lost, but deep beneath the swells of the ocean waits something sinister, and far from terrestrial. Meanwhile pirates loom above the surface, hoping to swoop in and claim that booty for themselves. Nothing goes according to plan, and very few, if any, will survive what becomes a truly treacherous adventure. Red delivers memorable characters and a pair of fine parallel conflicts. As readers we’re yanked into a tense scenario in which everything stands to be gained, and somehow even more stands to be lost. The action is steady, the mystery is alive and well, the science fiction angle is present but not over-imposing and the novel’s conclusion will leave your head spinning 360 degrees. There isn’t a base that goes uncovered in Red’s latest, and if terror on water tales float your boat, this is an absolute must-read. Samhain has delivered big in 2014. Titan took the title of best genre publisher last year, but Samhain has been damn near unrivalled this year. Among the greatest of their annual releases rest’s Red’s It Waits Below, a gripping story that could easily see cinematic transfer in the future. We got a wicked underwater novel this year, but it’s been some time since we’ve seen a compelling film of similar nature. Maybe It Waits Below will mark a return to the mariner’s cinematic nightmare in the near future.